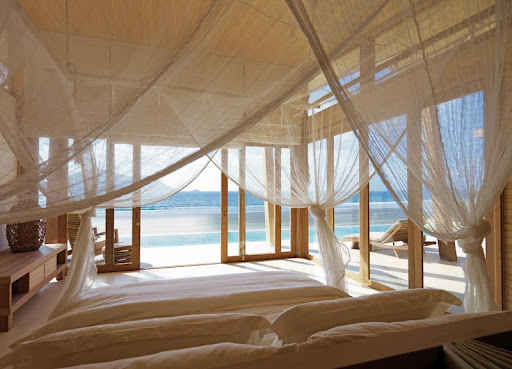 VNRE – The design of Six Senses Con Dao in Vietnam created by acclaimed architects, AW2, in collaboration with renowned owner/developer, Indochina Land, received the prestigious Best Hotel and Tourism Resorts Design Award at the 2012 MIPIM Awards in Cannes, France this month. In late January, the MIPIM jury met to examine more than 100 projects worldwide – either completed or upcoming – to select three finalists in each category that demonstrated outstanding technical and architectural qualities. This year, the geographical spread of projects provided an exceptional panorama of the global market. 47 countries were represented. Combined with the jury’s ranking, MIPIM delegates voted during the four-day event to determine the winners. Six Senses Con Dao garnered first place over two other finalists in the Best Hotel and Tourism Resorts category: The Bulgari Hotel & Residences in the United Kingdom, and the Victoria Tower Hotel in Sweden. The 2012 MIPIM award follows a steady stream of accolades that Six Senses Con Dao has received since the property opened in December 2010. In 2011, the property was rewarded with a Green Good Design Award by the Chicago Athenaeum of Architecture and Design; an International Property Award for Best Small Hotel Construction and Design in the World; in addition to being included on Conde Nast Traveler’s “Hot List 2011,” and featured on the cover of Travel + Leisure USA for their “IT List 2011″ edition. Indochina Land has similarly achieved wide-spread recognition as the top real estate group in Vietnam, being named Best Developer in Vietnam in 2011 for the second time in the last three years by Euromoney’s Global Real Estate Poll. Six Senses Con Dao – the first and only 5 star resort in the Con Dao archipelago – sets the benchmark for excellence in Vietnam. 35 one-bedroom hotel villas and 15 three- and four-bedroom residential villas all offer panoramic ocean views and an unparalleled standard of luxury. The award-winning sustainable architecture is located sensitively within the natural slope and contour of the surrounding dunes, utilizing only natural, reclaimed and sustainable materials that blend seamlessly into the spectacular native setting. True to Six Senses’ philosophy of selecting remote but accessible destinations in areas of outstanding natural beauty, Con Dao is an untouched and breathtakingly beautiful destination, protected for decades to come as a national and marine park.